2020 US Election: Who will win the Democrat race to take on Donald Trump? 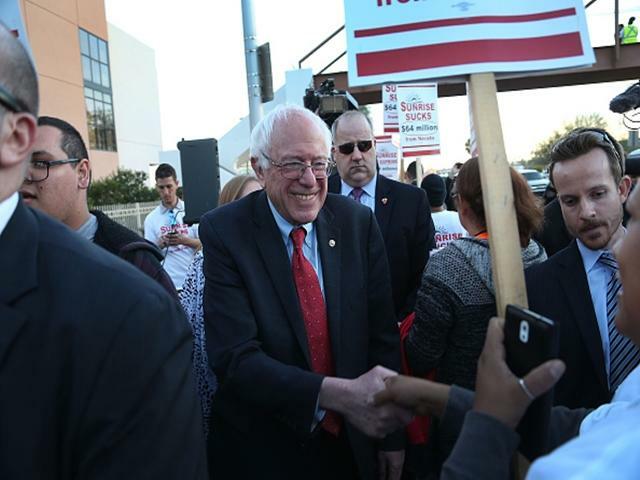 Bernie Sanders remains hugely popular but is he too old? "Often billed as the next Democrat superstar, Kamala Harris has been busy and vocal, fighting Trump on the left's key issues - particularly the failed repeal of Obamacare and plan to deport 'Dreamers'." Less than a year after the most memorable election in the history of political betting, it is time to start thinking seriously about the sequel. While speculation remains rife regarding whether President Donald Trump will again be the Republican candidate or even last a full term - he's only rated 50% likely to do so at even money in our Exit Date market - their Democrat rivals are set to serve up the most exciting market for 2020. Sensing a golden opportunity to take on an extremely damaged opponent in 2020, Democrat hopefuls are already staking out electorally advantageous positions and raising their profile in the key primary states. Let's take a closer look at some of the leading runners, at least according to the betting. The ideal Democrat candidate these days would probably be a minority woman, currently earning medals as part of 'The Resistance' to Trump. Step forward the one to beat in this race. Often billed as the next Democrat superstar, Kamala Harris has been busy and vocal, fighting Trump on the left's key issues - particularly the failed repeal of Obamacare and plan to deport 'Dreamers'. Junior Senator for California, if Harris runs she could get a big early delegates boost now that the Golden State has pushed it's primary forward to Super Tuesday. Notably, she's signed up to Sanders' single-payer healthcare plan - which is fast becoming the defining issue for the Democrat candidates. Warren emerged as the darling of the liberal left in the wake of the 2008 bank crisis. A driving force for consumer protections before entering politics, she chaired the Congressional panel scrutinising the bailout and used that stage to expose and bash greed and corruption on Wall Street. Many argued that she should have run in 2016 and opting out may prove a mistake as her star shone brightest around the time of the Occupy Wall Street movement, since when other progressive leaders have emerged. Though very much a contender, Warren divides opinion and is far from certain to be re-elected in Massachusetts next year. Trump would doubtless relish taking on a regular Twitter sparring partner, whom he mockingly labels 'Pocahontas'. Bernie will be 79 in 2020 but, until ruling himself out, must be considered one of the front-runners. A recent survey rated him the most popular US politician and his, once relatively radical, agenda is fast becoming the mainstream within the Democratic Party. Many on the Left have concluded that the party screwed up by not picking him, and it is certainly true that Sanders polled vastly better than Clinton in theoretical head-to-heads versus Trump during primary season. Whether a candidate or not, and age must surely be a big negative, he will play a part in the process and any endorsement will be pivotal. Booker has long been regarded as a future candidate and was often touted as a potential running mate for Clinton last time. Impeccably connected with the party establishment, the New Jersey Senator has been a big recipient of Wall Street donations. However whereas historically that ability to raise money was an essential advantage, now it could prove costly among a primary electorate that is fast moving left. It isn't clear Booker will run but his support for single payer was a notable olive branch to the left. The other famous 'what if' of 2016 concerns Biden's decision not to run, after flirting with a third tilt at the presidency for months. Again, Obama's VP tended to enjoy enormous head-to-head poll leads over Trump and would undoubtedly have been stronger than the damaged Clinton. Like Sanders, age is a huge handicap - Biden will be 77 in 2020 - but speculation is mounting about another bid. Be warned, however, that he seems to just love playing the 'will he/won't he' game with the media. If Harris isn't the one, then Gillibrand may be. The junior New York Senator is another fast rising star, making a big name as part of 'The Resistance' - most notably on healthcare. Again, she's signed up to single-payer. However despite earning plenty of column inches regarding her 2020 plans, she has ruled it out. A risky bet, therefore, but politicians do change their minds and the odds are very attractive. Although she has declared herself retired from frontline politics, Hillary Clinton's detractors will never believe she's given up so don't be surprised to see a gamble develop. For my money, there's no chance of a comeback after such a shocking campaign and loss. Nor do I rate any of the celebrities and business people who are popular in early exchanges. Whatever his long-term ambitions, Mark Zuckerberg comes across as too young and inexperienced. Plus Facebook are embroiled in the Russia scandal. At [28.0], Dwayne Johnson is a bizarre price - presumably on the back of a joke he made on SNL. Were Michelle Obama to pursue a political career, she'd have a fantastic chance, but there's absolutely no hint of it. Oprah Winfrey is the latest celebrity gamble. It seems in the wake of the Trump miracle, punters are looking for ever more outlandish political bets. It couldn't happen again, could it?